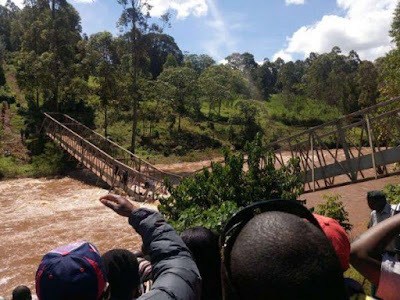 Government officials, journalists and elated residents of Ogembo (a farming town in Kenya), were shocked as the Governor of Machakos County, Alfred Mutua; and others plunged into the river while taking a tour of a newly constructed footbridge. It turned out that the contractor did a shoddy job, as the footbridge gave way under the weight of dignitaries and villagers who had trooped out to celebrate the project. The Punch reports that the governor, the deputy governor, as well as two journalists, fell into the water, before they were rescued.